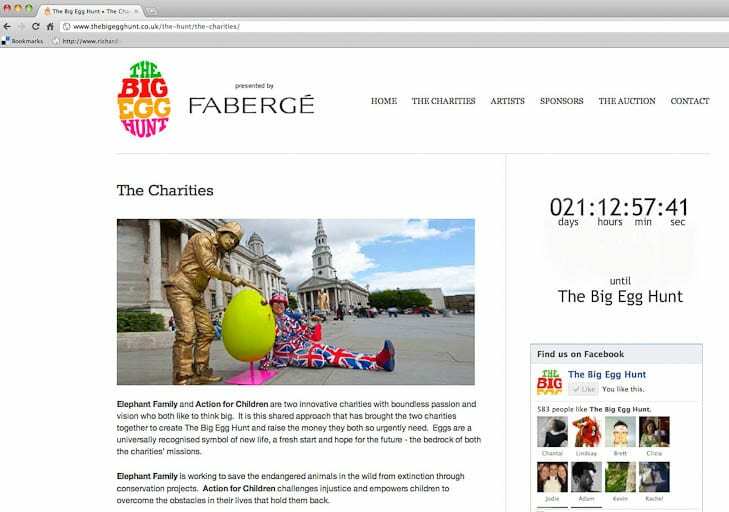 The Fabergé Big Egg Hunt publicity pictueres – you are welcome to copy the pictures but please credit me & my website in any usage, thanks. 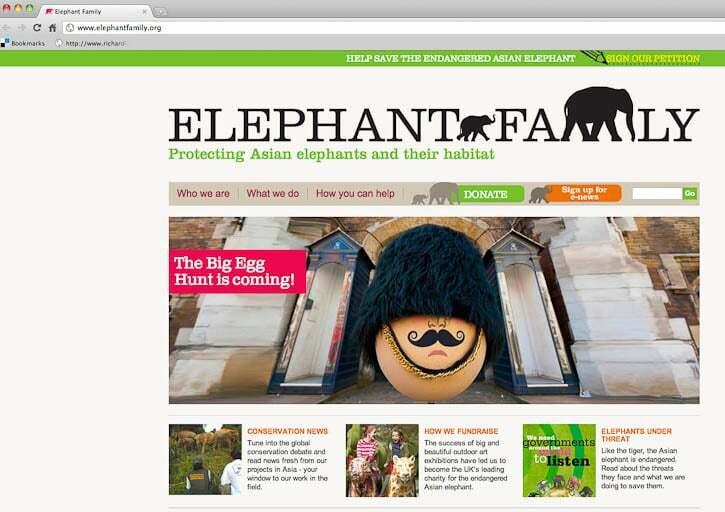 Last summer I was commissioned by Elephant Family and Action for Children to take publicity shots for a major fundraising initiative they were planning to launch in 2012. 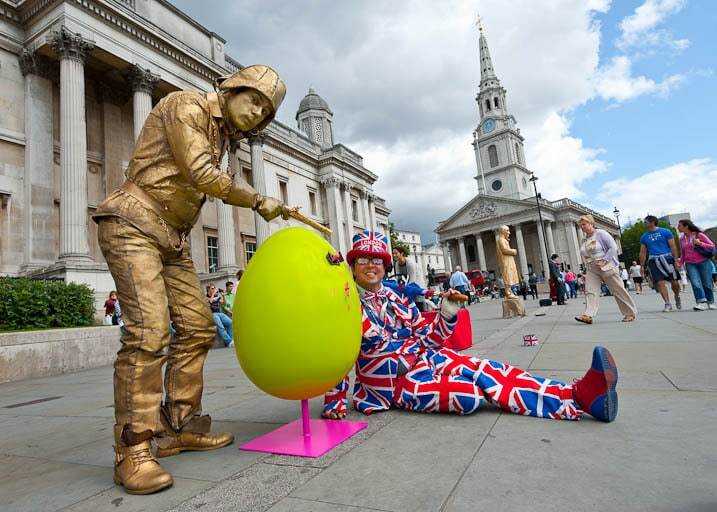 The charities asked leading artists, designers, architects and jewellers to create over 200 uniquely crafted giant eggs for use in the biggest and most fantastic Easter Egg hunt that London has ever seen – starting Shrove Tuesday, 21 February 2012. 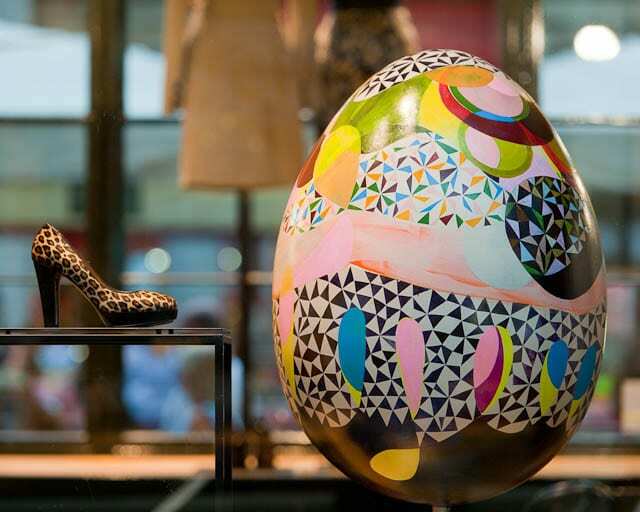 It’s an eggs-tremely (sorry couldn’t resist) high profile initiative with a host of big names involved, so I was eggs-cited beyond belief to work on such a commission. 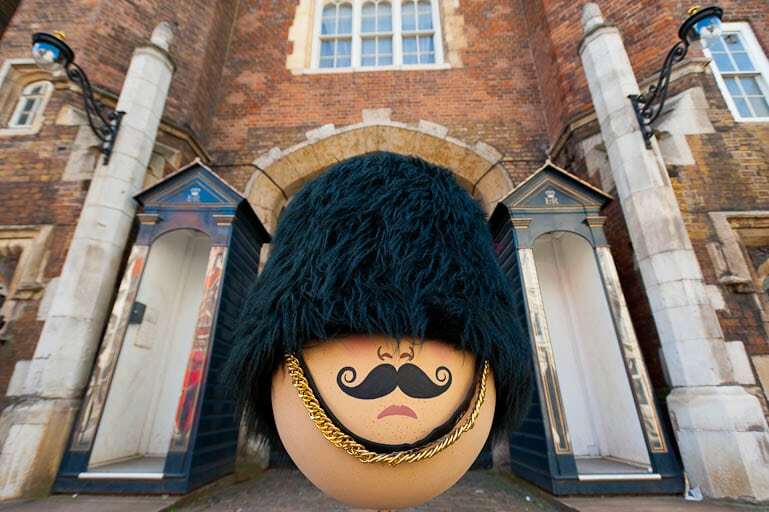 Last summer’s shoot involved taking pictures of a selection of these 2.5 foot high eggs against a backdrop of classic London landmarks and icons. 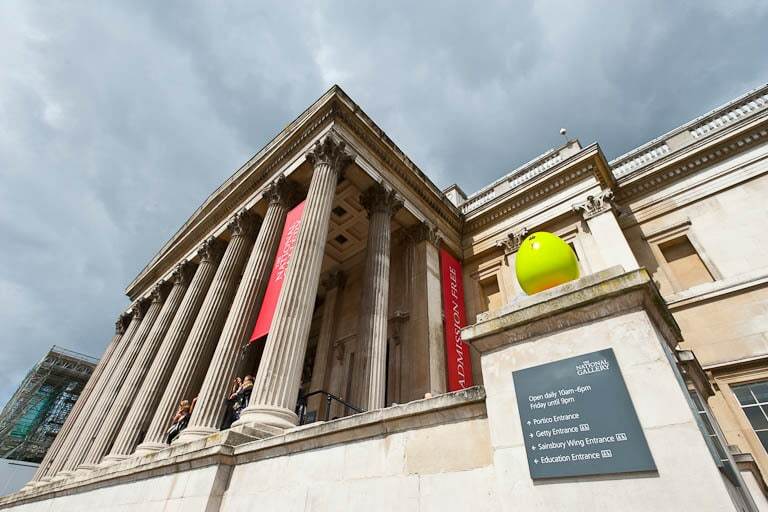 Environmental context was key, so I selected my ultra-wide angle 17-35mm lens for the majority of shots and hot-footed it around London with my client and these eye-catching works of art. 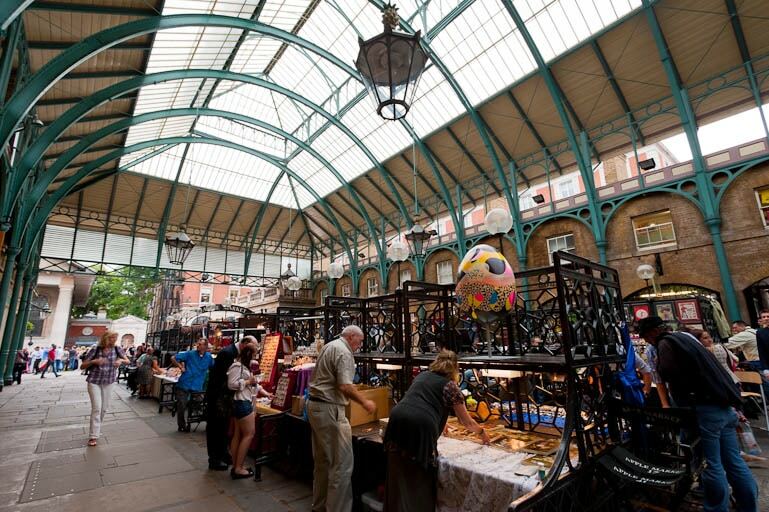 If you fall in love with any of these pics and feel YOU HAVE TO HAVE ONE – fear not, you can order prints or buy rights-managed downloads by clicking on the below slideshow, which will take you through to my Photoshelter site. Yippee!!! 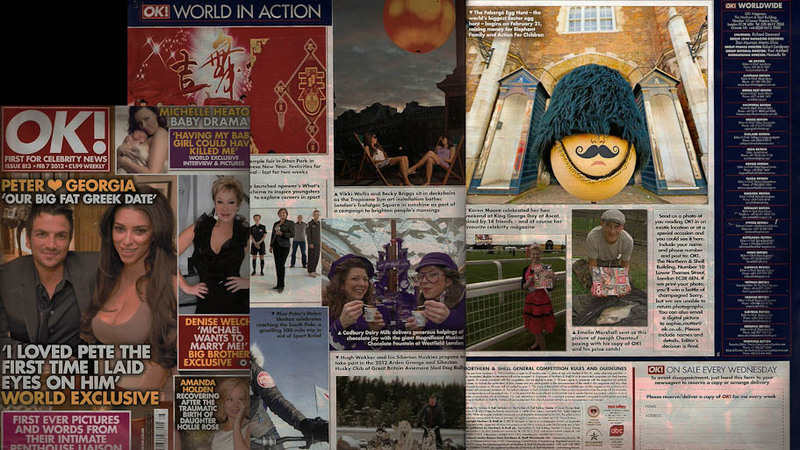 The shots are being used in the initiative’s marketing and PR campaign, and have been featured across charity trade websites & publications, and more recently the national media. 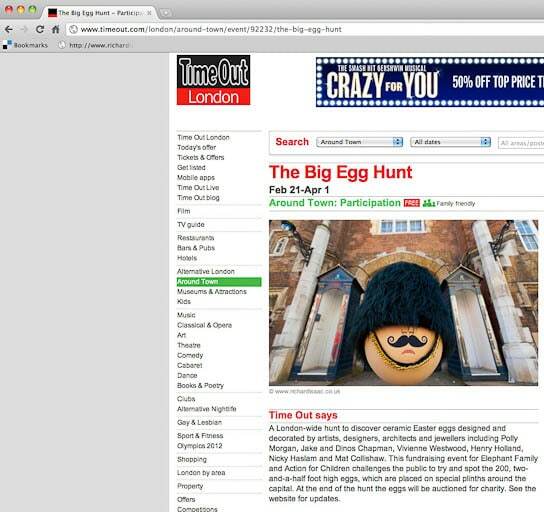 A few eggs-amples (OK I’m stopping now) are below. 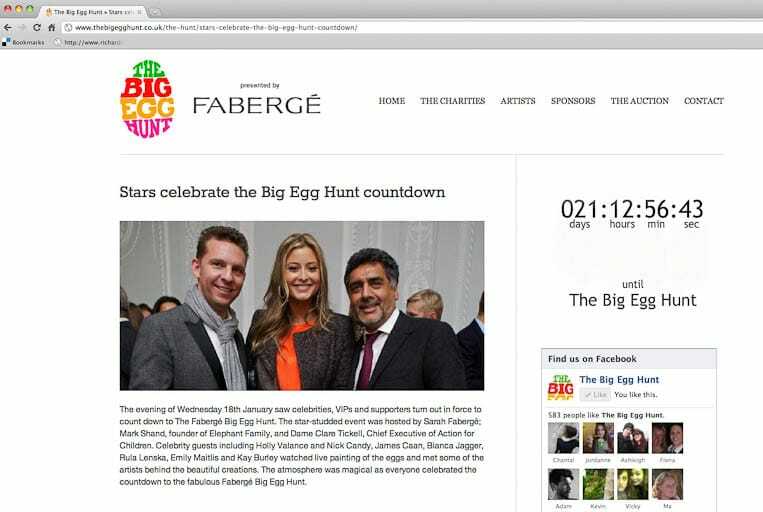 The egg hunt launched last week on Shrove Tuesday with coverage all over the media. 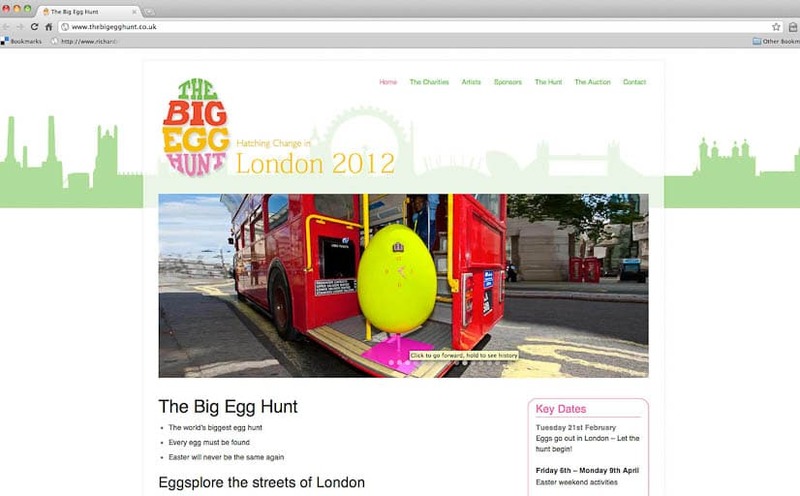 Unfortunately less than a week in it hit the headlines in a dramatic way – two of the eggs were stolen! 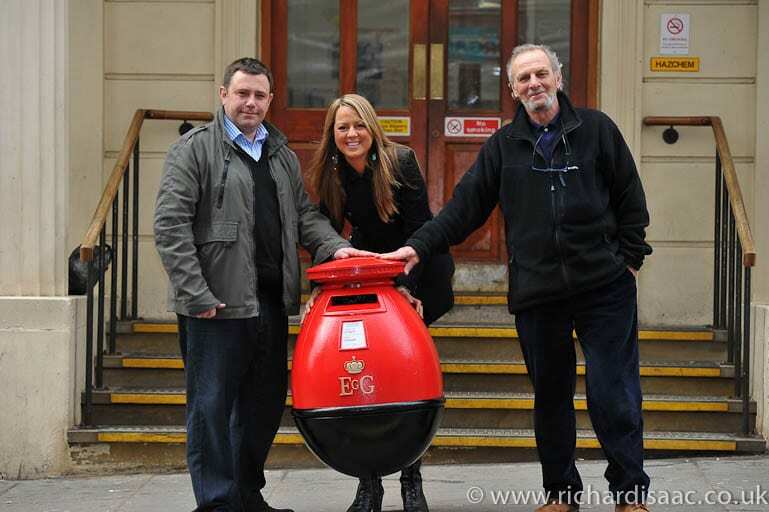 One was quickly found, but iconic red Egg Letter Box egg was still missing. 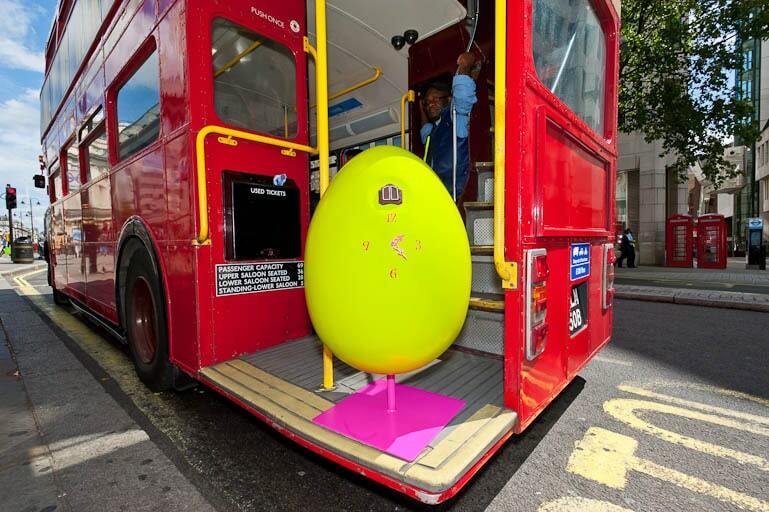 The police came to the rescue and informed the Big Egg Hunt organisers that it had been found, and could be collected from Charing Cross police station. 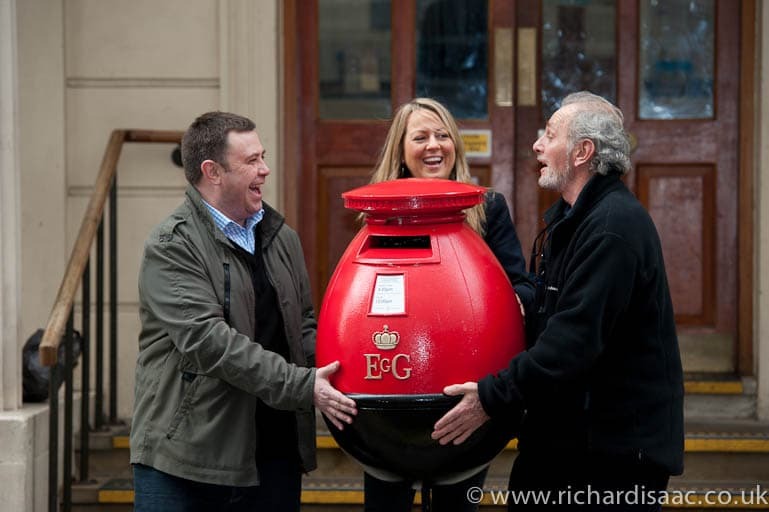 The Evening Standard wanted to cover the story and I was asked to photograph Elephant Family founder Mark Shand, Action for Children Fundraising Director Andrew Harris, and Big Egg Hunt director Rachel Waldron, proudly retrieving the egg. 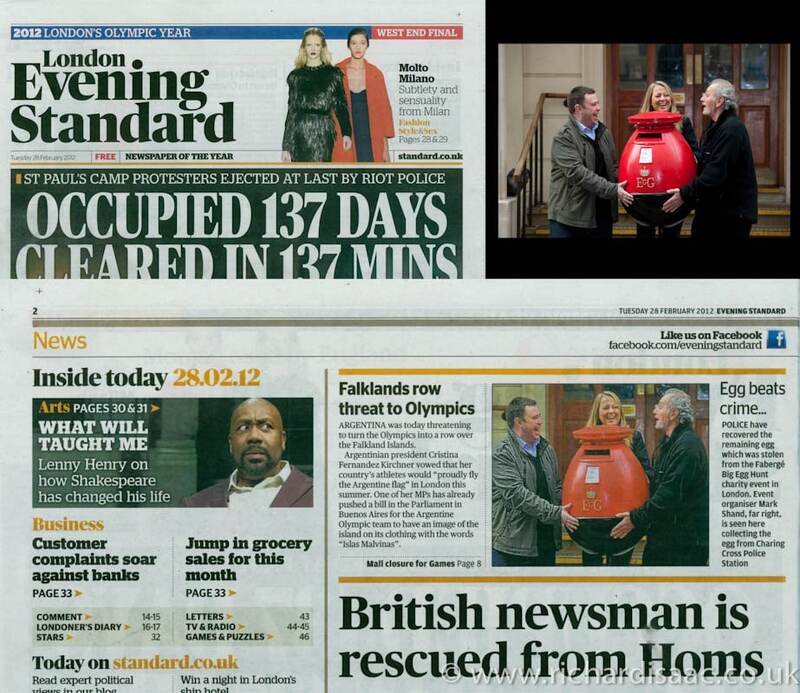 The story (and my picture) ran on page 2 of the Evening Standard, 28th February 2012. 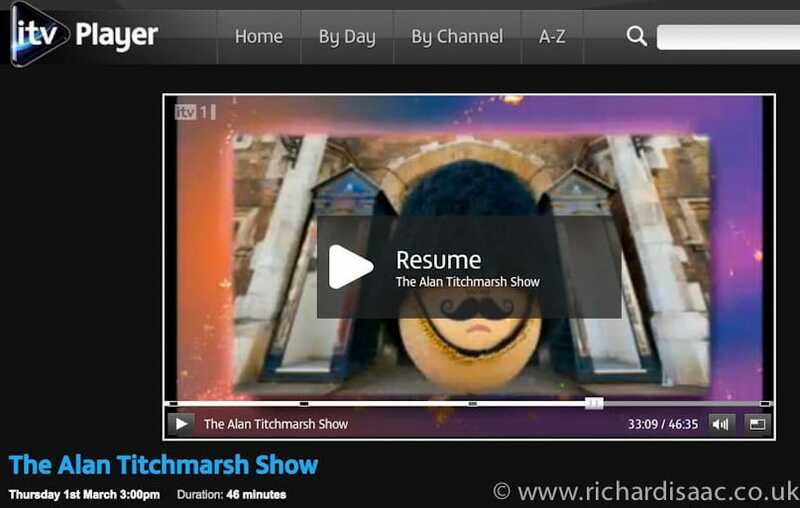 Not only that, but these pics and my original publicity shots from last summer were used in coverage of the egg hunt on the Alan Titchmarsh Show on March 1st.